Russian food is one of the most diverse and fascinating in the world. It developed over hundreds of years, incorporating Christianity and the changes that it brought, as well as pagan foods and culinary traditions. Due to the cold weather that lasted up to nine months in some areas, Russians prepared their winter food in advance, during the summer, making various preserves, pickles, jams, and salted, dried or smoked meat and fish. In Soviet times, when store shelves were often empty, many Russians relied on the pickled fruit and vegetables that they had grown themselves at their country plots. Many of those preserved foods remain popular icons of Russian cuisine. Russian dishes reflect a rich history of interaction with other cultures, resulting in unique foods and tastes. Many foods were prepared in the summer and used during the six to nine cold months of winter. This created a fascinating culinary tradition with hundreds of recipes of pickles, salted, dried or smoked meat and fish, and foods that kept for months, such as pelmeni. Many Russian dishes originated as a way of utilizing leftovers but became everyday staples. Russian pierogi and other baked foods were originally made on special occasions or as part of a religious ritual. Borscht is arguably the most well-known Russian dish in the West, although it is usually incorrectly translated as beetroot soup, which doesn't make it sound as great as it really is. Made with meat and vegetables that usually include potatoes, carrots, onions, cabbage, garlic, and beetroot, borscht is a staple dish of the Russian culture. There are various versions of its origin, including that it came into Russian cuisine from Ukraine, where it is also extremely popular. Originally, borscht recipes called for beetroot kvas (a fermented drink) that was diluted with water and boiled. Nowadays, a little bit of sautéed or otherwise prepared beetroot is added at the very end of the cooking process. There are countless versions of borscht recipes, with each cook convinced that theirs is the right one. It can be made with mushrooms, with or without meat, using red meat or poultry, and even fish. Although originally borscht was a dish for the commoners, Russian royalty soon fell in love with it. Catherine The Great called it her favorite meal and had a special chef at the palace to make it for her. Similar to the Italian ravioli, the pelmeni is another staple food, which appeared in Russian cooking around the 14th century. It remained a popular dish in the Ural and Siberian parts of Russia until the 19th century, when it expanded to the rest of the country. 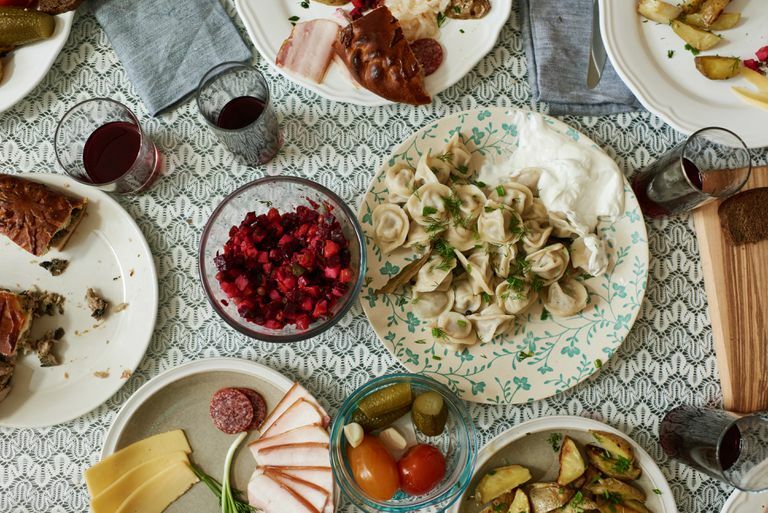 Although there are no exact details about its origin, most theories agree that pelmeni may have come from China, changing and taking on characteristics of the various cultures it traversed. Russians learned to make pelmeni from the Komi people indigenous to the Ural area. A simple but tasty and filling dish, pelmeni are made from meat, flour, eggs, and water, sometimes adding spices such as garlic, salt, and pepper. The small dumplings are then boiled for several minutes. Due to the simplicity of the cooking process, as well as the fact that frozen pelmeni can keep for months, this dish was popular among hunters and travelers who carried pelmeni with them and cooked them on a campfire. Blinis come from the Slavic pagan traditions and symbolize the sun and the gods that represent it. They were originally made during the week of Масленица (the religious and folk holiday before the Great Lent) and are still one of the most favored dishes in Russia. There are various recipes for blinis, including small drop-scones, lacy paper-thin large blinis, sweet thicker pancakes made with milk, and many more. They are often used as wraps with meat, vegetable, and grain-based fillings. The pierogi have traditionally been a symbol of domestic bliss and culinary prowess in Russia and were originally only served at special occasions or to welcome guests. The word пирог comes from пир, meaning a feast, which gives a good idea of the symbolic meaning of this popular dish. Each different type of pierogi was used for a different occasion. For example, on name day a cabbage pierog was served, whereas Christenings were accompanied by sourdough pierogi that had a coin or a button inside, for luck. Godparents received a special sweet pierog just for them, to demonstrate their special meaning to the family. Although there are hundreds of different recipes for this dish, they were traditionally made in an oval or rectangular shape. Eventually, the pierogi became part of everyday cooking thanks to their convenience, as they are made with ordinary ingredients that are available to anyone. A smaller version of the pierogis, pierozhki can be fried or baked and appeared as a more convenient alternative to the large pierogis. Sweet and savory fillings are popular with this dish, including potatoes, meat, and apples. A Ukrainian dish, vareniki are very popular in Russia, particularly in the Southern areas that are close to Ukraine, such as Kuban and Stavropol. They are very similar to pelmeni, but are usually larger and have vegetarian fillings, which are often sweet. Ukrainians adopted the recipe from the Turkish dish dush-vara. In Russia, most home cooks make cherry, strawberry, or curd cheese-filled vareniki. An ancient Russian soup, Ukha originally meant any kind of soup but eventually came to mean fish soup in particular, and from the 15th century onwards has been a fish dish unique to Russia. A classic version of this dish requires fresh fish, possibly even still alive, and only the types of fish that have a particular sticky, delicate, and sweet flavor can be used, such as pike-perch, bass, ruffe, or whitefish. Ukha can only be cooked in a non-oxidizing pot made of clay or enamel. The traditional recipe produces a sticky, transparent soup that doesn't have a strong fish smell, while the pieces of fish remain juicy and tender. As the word окрошка (made of crumbs, pieces) suggests, this traditional Russian dish was made from leftovers, originally vegetables covered with kvas, a unique Russian drink made from bread. Okroshka was a poor man's dish, but eventually became popular with the rich, too, whose chefs began adding meat. During the Soviet era, kefir, a traditional fermented drink, sometimes replaced the kvas, although the reasons for that are unclear since both drinks were widely available. Okroshka is served cold and is a refreshing dish to have in the summer. Similar in taste and preparation, these traditional Russian dishes are a variation of aspic and are made with beef and pork, creating a tasty meat jelly. Originating in France in the shape of Galantine, this dish was brought to Russia by the French chefs employed by the Russian aristocracy. Studen already existed in Russia at the time, but was usually given to the poor as it was a much less appetizing dish made from crumbled leftovers after a big feast or a dinner party. The French chefs improved the dish by adding a bit of natural color and created a new dish, which also became very popular: the Zalivnoe (Заливное). Nowadays, the kholodets and the studen are interchangeable terms and are a popular choice at New Year celebrations. A sweet dish on the base of semolina, Guriev's Kasha is considered a traditional Russian dish, despite only appearing in the 19th century. Alexander III often called this dish his favorite meal. Its name comes from Count Dmitry Guriev, Russia's finance minister, who inspired a serf chef to invent the dish when the count visited an old friend. The chef named the dish after the guest, who later on bought the chef and his whole family and freed them, giving the chef a job at his own court. Made with cream or full-fat milk, thick semolina kasha, various dried and preserved fruits, and varenye (Russian whole-fruit preserve), Guriev's Kasha has remained a symbol of Russian aristocratic lifestyle. Kashas (porridge or gruel) were usually made with grains and were included in various recipes, including the pierogi, blini, and desserts, or eaten on their own. Recipes of kashas often include adding meats, fish, or salo, another traditional Russian dish made of salted pickled pork fat.